Action from Bury v Mansfield. Nicky Maynard's stoppage-time goal denied Mansfield two potentially priceless points. Maynard slid home his second goal of the game from 15 yards five minutes into seven of added time at the end. The result means the Stags have now drawn all five of their away games this term. The hosts bossed the early exchanges at sun-drenched Gigg Lane. Tricky midfielder Danny Mayor expertly teed up Nicky Adams, but the Bury wide-man scooped an effort disappointingly over the top from 15 yards. Minutes later skipper Neil Danns fired in a shot following a mazy run, with Stags 'keeper Bobby Olejnik saving well. 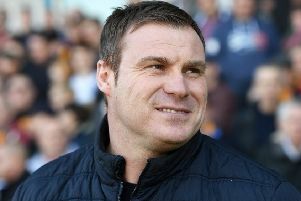 Flitcroft's men bagged themselves a bizarre opening goal after 10 minutes. Danny Rose profited as the ball slipped out of Joe Murphy's grasp when the Bury 'keeper prepared to make a regulation clearance. The ex-Bury striker went on to tap the now loose ball into an unguarded net from five yards. Murphy atoned for his clanger minutes later when he saved superbly from Otis Khan. While the hosts were stunned, the Stags had gained confidence from their shock opening goal, and they should have scored again after half-an-hour when Rose fired wide from 15 yards when he only had Murphy to beat. The Stags were on top after the restart. Khan went on a terrific run before curling an exquisite shot inches wide from just outside the box. However, Bury evened the score spectacularly in the 55th minute. Adams headed the ball hopefully towards Maynard eight yards from goal, and the home striker swivelled superbly before lashing home with a breath-taking scissor kick. It was the Stags who regained the lead after 73 minutes, however. Defender Preston struck, powerfully heading home Timi Elsnik's floated corner-kick. Minutes later sub Will Atkinson fluffed a great chance to make it 3-1, before Maynard struck his late, late leveller.